There is art that ends up in museums, and then there is art designed specifically for a museum. Both have their merit, with the latter usually destined to temporal-conceptual trends and the former having a greater chance at enduring posterity. “Story/Time” is a conceptual performance that developed in front of cameras with lighting and furniture, and not in a studio with dancers. It gambles with chance and random synchronicity the way that American avant-garde composer and writer, John Cage, developed his works based on the Chinesedivination practice of the I Ching. “Story/Time” is an homage to John Cage, whose 1959 “Indeterminacy” inspired the structure. When performing “Indeterminacy,” Cage sat alone on stage reading 70 of his minute-long stories uninterrupted. Accompanying his narrative was a randomly selected musical score composed by David Tudor. For Jones to mirror Cage both visually and structurally — sitting center stage behind a desk, reading 70 of his 60-second personal stories, arbitrarily sequenced and selected out of 100 total by Random.org (a website designed specifically for holding drawings, lotteries and sweepstakes, etc.) — is a substantial risk. 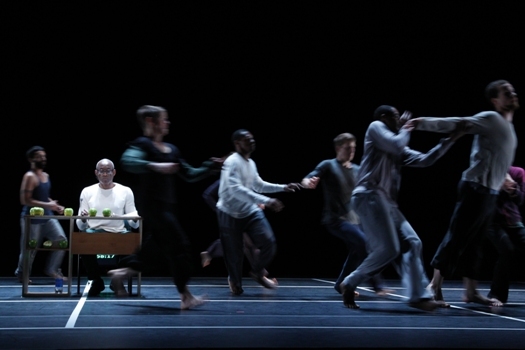 Jones places himself and his dancers in a clinical jeopardy for the random and inevitable possibility of spontaneity, and to keep them all on edge in the hopes of unsullied freshness. Each performance of this multilayered piece is therefore unique, with text and movement meeting — or not. Not only is this a personal departure for Jones — known for leaving little to chance and basing his work on political expressionism and message — but also for his outrageously good company, who learn about the performance’s sequence hours before curtain. This indiscriminate sequencing is then fine-tuned by Jones and Associate Artistic Director Janet Wong. Seventy minutes of choreography are selected from a changing itinerary of 35 items spanning 105 minutes. Composer Ted Coffey then generates his evocative musical score for each performance. Coffey’s score has a range of mixed sound from the subtle to thunderous that, at times, silenced Jones, leaving the impression that he was talking to himself. The table sits in the center of a floor grid that divides the stage into nine sections. Dancers perform certain segments within these sectionals based on cue cards placedoutside the grid to remind them of the current performance order. Props, such as a couch, a chair, a two-paneled translucent screen, are pulled and pushed into areas,and seemingly in and out of the text. The screens define space within parts of these subdivisions as dancers perform behind, in front of or within. The choreography is casual yet precise; thecompanyflawlessly fluid, athletic, individually distinctive, and nonstop as they tumble, leap, and are swung through the set. Robert Wetzel’s radiant lighting is crisp without losing the rich darkness that prowls around the edges of dancers. Most seductive is a dream-like sequence, where Jones is backlit, the stage smoked, and dancers roll across the set, some clothed, some naked. “Story/Time” is challenging for the audience as well, who has to decide where and how to enter our attention, as well as where we want to place it throughout. This is not a passive performance; you have to work at it while a digital clock ticks down 70 minutes at the back of the stage. If you are audio oriented, you will fall into the literalness of Jones’ mostly autobiographical travelogue and “culturalogue” — which at times sounds like a litany of who’s who in American high-art elite. Names like Angela Houston, Jasper Johns, Betty Freeman, Thelonious Monk, Abbey Lincoln, Joan Mitchell… land more conspicuously than the dancers. With only a minute to each story, it seems like not using the iconic names so often would not only be self-effacing but also, it would not stand out out bigger than the tale itself. For movement enthusiasts, your attention will try holding onto the beautifully rich choreography, with its underlying tick-tock tension. For those, Jones’ stories will blur into his resonant and hypnotic tone like a lullaby oozing in and out of the score. The stories themselves will be less significant, serving as another track to the music score or as a counter rhythm to I-Ling Liu’s charmingly annoying rendition of a Taiwanese pop song. But, whatever your proclivity, you will be pulled in and out of it as if viewing “Story/Time” from a holographic cube suspended in space. Whether or not you like it, whether or not you’ll remember “Story/Time” over time will depend on a number of random factors. Whether you see it as a conceptual experiment intended to force Jones and the rest of us beyond a familiar comfort zone, or as a dance theater piece worthy of the ages, ultimately depends on the tumble of the dice.